Sample shown in Black ink on Ivory Stock. Sample shown in Fuchsia Ink on Ivory Stock. 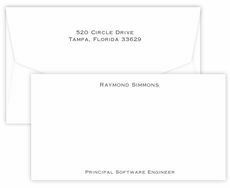 A set of flat note cards printed cards in your choice of raised-ink color with envelopes. Size is 6.2" x 4.5". Blank envelopes included. Return address available. Your choice of triple thick stock color. Upper/lowercase lettering and positioning only as shown. 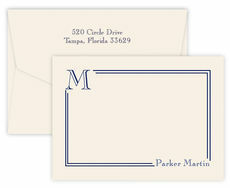 Sample shown with white stock and navy ink.